Citation Information: J Clin Invest. 2017;127(8):3052-3064. https://doi.org/10.1172/JCI89756. BACKGROUND. Ibrutinib has been shown to have immunomodulatory effects by inhibiting Bruton’s tyrosine kinase (BTK) and IL-2–inducible T cell kinase (ITK). The relative importance of inhibiting these 2 kinases has not been examined despite its relevance to immune-based therapies. METHODS. Peripheral blood mononuclear cells from chronic lymphocytic leukemia (CLL) patients on clinical trials of ibrutinib (BTK/ITK inhibitor; n = 19) or acalabrutinib (selective BTK inhibitor; n = 13) were collected serially. T cell phenotype, immune function, and CLL cell immunosuppressive capacity were evaluated. RESULTS. Ibrutinib markedly increased CD4+ and CD8+ T cell numbers in CLL patients. This effect was more prominent in effector/effector memory subsets and was not observed with acalabrutinib. Ex vivo studies demonstrated that this may be due to diminished activation-induced cell death through ITK inhibition. PD-1 and CTLA-4 expression was significantly markedly reduced in T cells by both agents. While the number of Treg cells remained unchanged, the ratio of these to conventional CD4+ T cells was reduced with ibrutinib, but not acalabrutinib. Both agents reduced expression of the immunosuppressive molecules CD200 and BTLA as well as IL-10 production by CLL cells. CONCLUSIONS. Ibrutinib treatment increased the in vivo persistence of activated T cells, decreased the Treg/CD4+ T cell ratio, and diminished the immune-suppressive properties of CLL cells through BTK-dependent and -independent mechanisms. These features provide a strong rationale for combination immunotherapy approaches with ibrutinib in CLL and other cancers. TRIAL REGISTRATION. ClinicalTrials.gov NCT01589302 and NCT02029443. Samples described here were collected per OSU-0025. FUNDING. The National Cancer Institute. Ibrutinib but not acalabrutinib treatment of CLL patients increases total T cell numbers. (A) Absolute numbers of CD8+ (upper panel) and CD4+ (lower panel) T cells before and during ibrutinib treatment (n = 18). (B) Absolute numbers of CD8+ (upper panel) and CD4+ (lower panel) T cells before and during acalabrutinib treatment (n = 12). Each cycle is 4 weeks. Cycle 3 indicates samples obtained after 2 cycles (8 weeks into treatment), and cycle 6 indicates samples obtained after 5 cycles (20 weeks into treatment). 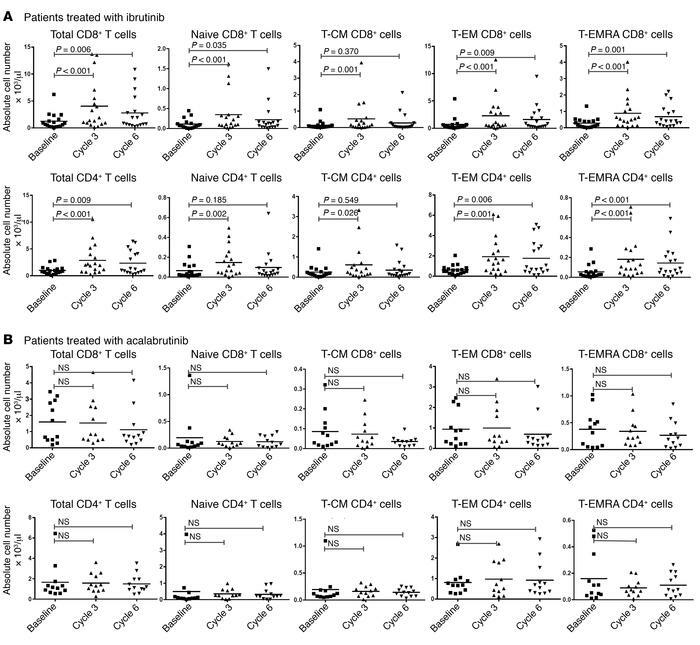 T cells were differentiated into subsets based on expression of CCR7 and CD45RA: naive T cells (CCR7+CD45RA+), central memory T cells (CCR7+CD45RA–), effector memory T cells (CCR7–CD45RA–), and more differentiated effector memory T cells (T-EMRA; CCR7–CD45RA+). Differences were assessed using linear mixed-effects models. NS, not significant.